05-Sep-2006 -- This point lies in the southern tip of the Kyzylkum desert which covers a huge percentage of Uzbekistans area. It is one of the more accessible since a road running nearby spares the visitor a 30 km hike through the desert. Just a few kilometers west are Shengeldi and Bolokarak, two rather dismal and poor settlements in the middle of nowhere. Apart from a little animal breeding (sheep's, goats, probably camels) there is nothing to live on. The dried up salt lakes surrounding this little villages add an almost surreal quality. Needless to say that the roads in the area are terrible. The pavement consits of gravel glued together with bitumen and spread in a thin layer over the road. Potholes in all sizes abound. On the way to the confluence we saw quite a few isolated Industry and Mining ventures in various degrees of decay, and even a busy new facility exploiting the natural gas resources underneath Zafarobod. 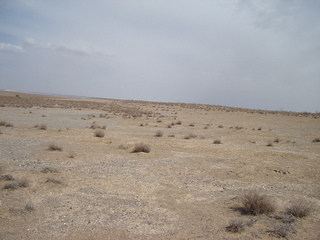 The area has sparse vegetation, the sand is dark yellow on the surface and bright red underneath. The patterns of cracked clay around the confluence and one ore two washed out ditches betrayed that the region gets some rain at least at one point in the year (most possibly in spring). The animal life (apart from the odd sheep flock) is dominated by snakes. They rest during the day in the many holes which are scattered on the ground, and come out in the late afternoon when the sun looses its devastating power. We saw remarkably many dust devils and whirlwinds on the way, circling angrily through the desert, sucking up dust and dried twigs like giant vacuum cleaners. The R61 lead us within 2,3 km of the confluence. I needed less than one hour to make the round trip. Despite of this I suffered severe dehydration, and was thoroughly exhausted after coming back.